Additional: This is a very young parakeet. If you lost one please contact me and describe. Additional: Please help me find my beautiful birds. They like to be call Peter and Pretty Bird. 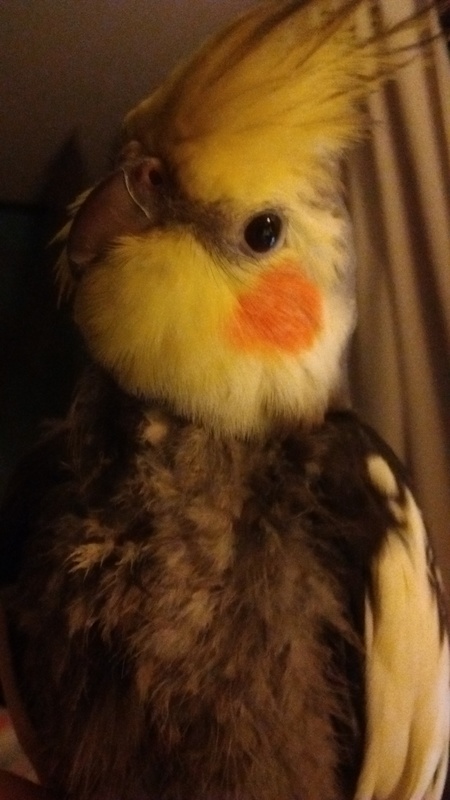 Markings: I believe this is a young pied cockatiel. Additional: He is very sweet and will likely come up to a human, answers to "Cowboy"
Additional: A reward will be given to anyone who can bring him home safely. Markings: Mostly white, grey tail, grey patches on body. Most significant patches are two on the back of his neck & shoulders. Additional: Please contact me asap if you have or have seen my kitty. Additional: Was playing with her when the door was accidentally left wide open. I went to go close it, when she flew outside. Additional: Young & scared, never outside before so no survival instinct, only knows seed & pellets as food, May try to land on shoulder or head. Markings: He's Grey with white undertones and has a bright red tail. Additional: His name is Hondo. He's scared, hungry and thirsty. He may come to you if you call out to him. Additional: Very loving, it has been here a few weeks (today is 5.29.16) upper body is black lower is white. I think it is 6 to 8 months, but it could be older. Additional: Very Friendly, seems healthy, but a little thin. Markings: White with brown-tan spots Chihuahua. She has a white "C" shape on top of her head. Additional: Coco is a rescue dog, her tail is broken from past abuse, so it's bent down a little. She rarely barks or plays. Locale: Lancaster Ave. at Russell Ave.
Additional: His name is Boots. He is micro-chipped and neutered. Had blue collar on with a yellow tag saying home again. There is a reward if found. Additional: Peluche is small white dog a little bit bigger than a basketball. Additional: Houdini is solid gray on other color fur. Eyes are gold-orange colored. His paw pads are purple-rose colored. Additional: Could also be in New Lenox or Plainfield areas! Please contact if you suspect you have seen him even! Markings: This is a blue parrotlett. Additional: Our bird is very friendly and loves people. Please help if found. We are very sad. Additional: Very friendly lost kitty. He is about 15 lbs. LARGE! Additional: Looks similar to the one in the photo in the URL provided. Additional: will question a characteristic of the rabbit, to make sure is going to its home! Additional: Jack is very friendly. He doesn't have a collar but he does have a micro chip. Additional: Found two female schnauzers together both were wearing collars but had no name tags. Additional: Shy but friendly, some times answers to Onyx, loves chin and under belly scratched. Family pet. Additional: Cat has a microchip#074318026. She has hairless spot on her stomach.